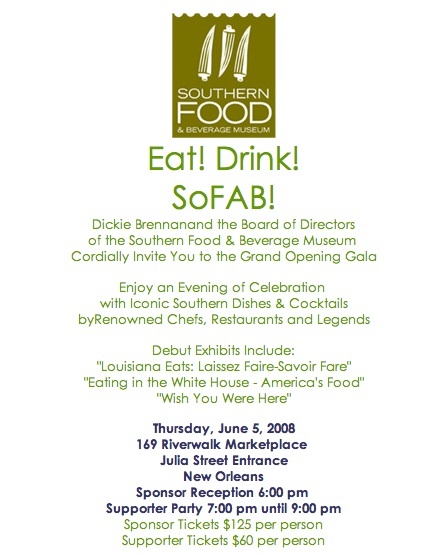 The Southern Food & Beverage Museum will be celebrating their very grand opening this week. Thursday evening there will be the opening gala and Saturday morning will be the ribbon cutting ceremony. These are good people who are working to preserve our Southern culinary heritage. I’ll be honest, when I first met Liz Williams, president of SOFAB, and she was explaining the project to me, the only Southern thing I could think of was putting peanuts into a bottle of Coke. I have no idea why that image popped into my brain, but after spending time in New Orleans, and tasting and observing the endless variations of roux and the value of the trinity, I now have a tiny inkling of what it is that this foundation is trying to preserve. A roux in its simplest form is fried flour, but you can fry it with butter, or with oil, light caramel color or cocoa color; it’s the foundation of Creole cooking. And the trinity is chopped peppers, onions and celery. I could kick myself for not figuring out a way to get into some southern kitchens so that I could watch and learn more about Southern style cooking. As the world becomes smaller and smaller, it becomes more and more important to honor and preserve our regional cuisines, whether it’s a Maine clambake, jambalaya, Sardinian carta da musica, or dim sum, they all make the world a much tastier place.